CLG updates on genetics and law; intellectual property and patents, ethics and regulation, privacy law, innovation and our news. 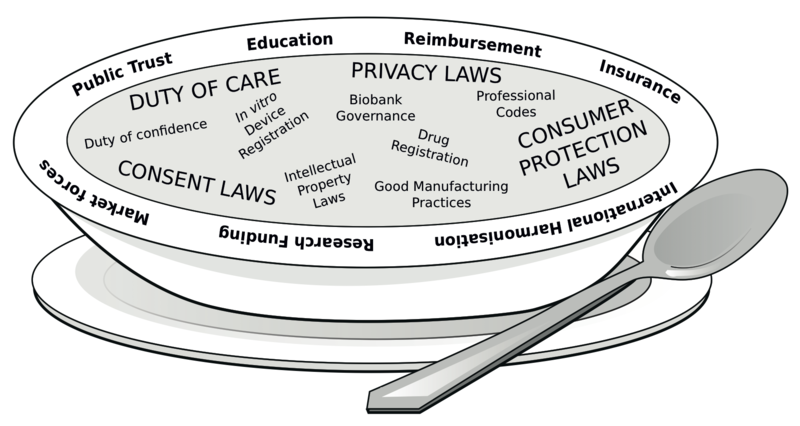 Last week the paper ‘Precision medicine: drowning in regulatory soup?’, published in the Journal of Law and the Biosciences became available online. This paper, led by Professor Dianne Nicol and co-authored by 16 others from cross-disciplinary backgrounds including law, health science, social science, bioethics and epidemiology, is written in response to the ‘confusion, veritable ‘regulatory soup’ that could drown the promised advances in precision medicine’. Many of these authors came together and met in Hobart, Australia in late 2014, to discuss the more general question of how the challenges of regulating for ‘precision’ or ‘personalised’ medicine might be addressed. The ideas for this paper were first voiced as part of a discussion that was conducted at this meeting. They have been developed into a comprehensive review of the current state of affairs, and inter-play between regulations in respect of delivery of personalised medicine. 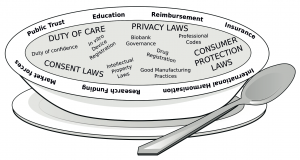 As the title suggests, the regulation in this area is not coherent and is a ‘soup’ – that is a broad collection of separate regulations that derive from different basis and legal instruments – that all are relevant to delivery of personalised medicine. As such, this article sets out important considerations and existing regulations. Highlighting that navigating the sets of laws is a primary problem. The authors suggest that regulation for this area ‘need not – and probably should not- result in new, highly targeted laws’ (at p 12). Also stating that the high level ethical principles should stand and not be modified to address these specific problems. However they reiterate the question of whether we are ‘drowning in the regulatory soup?’. And further, many of the individual regulations are subject to specific concerns of their own. (v) genuine engagement with all relevant stakeholders. These considerations should be taken into account by policy and law makers. They will also feed directly into the development of frameworks and regulations as well as reform thereof, where the authors and the CLG are involved. This entry was posted in CLG news, New publications. Bookmark the permalink.